Published: June 19, 2013 at 08:01 p.m. 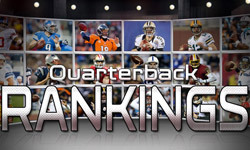 Updated: June 20, 2013 at 11:42 p.m.
We've taken a crack at ranking the best quarterbacks, running backs and wide receivers in the NFL this offseason. Next up: The edge rushers. This is a list of the players we'd want on our team for this season, and this season only. For the purposes of this list, we are not including interior rushers. So the list does not include great disruptive 4-3 defensive tackles like Geno Atkins or superhuman 3-4 defensive ends like J.J. Watt. Miller's speed is breathtaking. A lot of guys can run fast in a straight line, but Miller is football fast. He gets around the edge in an instant, and he combines that speed with great smarts and strength. Miller's already the best edge rusher and he might only get better. ... Matthews can be just as disruptive as Miller if fully healthy. He still should have a Defensive MVP season in him. ... Wake is the next most consistent pass rusher. Even when he doesn't get a sack, he's changing the play. ... Ware has declined slightly from his peak, but remains in elite form. ... Aldon Smith racks up sacks but is a little less consistent snap to snap compared to the players above him. ... JPP might have the highest ceiling of the whole group if he recovers well from back surgery and learns more veteran guile. Long has slowly, but steadily improved thoughout his five-year career. He only is hitting his peak now. ... Allen's sack totals declined last year, but he was still an effective pass rusher. The same is true for Peppers; he's still great even on the other side of his career arc. ... Bills fans saw in Williams what Texans fans often saw: very good final numbers that masked streaky play. Irvin remains a little rough around the edges, but he's a pure pass rusher. He could evolve into Seattle's counterpart to Aldon Smith. ... Woodley is coming off a brutal 2012 season, but he's too good and too young (28) to give up on. ... Charles Johnson quietly gets it done year after year in Carolina. His teammate Greg Hardy doesn't do anything quiet, and could pass Johnson as the best pass rusher on the team. Justin Houston and Tamba Hali also remain one of the league's better duos. ... Jones could be New England's most complete pass rusher since Willie McGinest. It wouldn't be a shock if he's a top-five guy before long. ... Dunlap is a fourth-year player we believe can take a significant leap. Kerrigan is the king of the near-sack, which suggests a breakout is around the corner. ... Quinn is part of a dangerous front seven in St. Louis and still hasn't realized his potential. ... Kruger was a part-time player until breaking out last season and cashing in with the Browns. ... Johnson put up most of his production in just a few big games before getting the franchise tag. Just missed: Cliff Avril, Trent Cole, Elvis Dumervil, Melvin Ingram, Everson Griffen, Brian Robison, Derrick Morgan, Lamarr Houston, Kamerion Wimbley, James Harrison, Dwight Freeney, Whitney Mercilus and Osi Umenyiora.